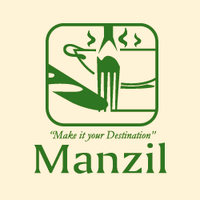 Menu - Manzil - 102 Market St.
Tikka‎ chicken or ghoust cooked w/ garlic, onion, coriander & capsicum. 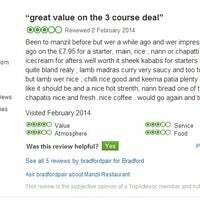 Very thick & spicy sauce, a medium hot curry. Tikka meat, chicken & king prawn cooked w/ garlic & garnished w/ onions & capsicum. A medium hot dish. Cooked w/ zeera (cumin seeds) , onions, capsicum, tomatoes & fresh ginger. A medium hot dish. Prawn, beef, chicken & mushroom cooked w/ herbs, spices pilau rice, nuts & sultana garnished w/ tomato, fried egg & coriander. Served w/ vegetable curry. Fish marinated in fresh herbs & spices, fried in pan w/ onion. Served w/ salad. A variation of the chicken massala. A Medium hot dish cooked w/ whole spices. King prawn cooked w/ mixed spices, onions, tomato & fresh beans. Cooked w/ herbs & spices, bullet chillies, onions, tomatoes & garnished w/ fresh coriander. (Fairly hot) A Persian dish cooked w/ lentils & pineapple w/ a sweet & sour taste.